TCL is one of the fastest growing TV brands in the world, offering the affordable yet powerful technology. TCL was originally an abbreviation for Telephone Communication Limited but now company markets its full form as “The Creative Life”. Though it may sound surprising but TCL is globally third largest manufacturer of TV after Samsung and LG and the biggest hailing from China. TCL was founded 37 years ago and prides itself on delivering high-quality products. Talking points of TCL TVs is stylish design and the latest technology. With good manufacturing expertise, a vertically integrated supply chain, and state-of-the-art foundry, TCL offers innovative TVs at a reasonable price. Amongst its excellent range, users have a gamut of options in the form of 4K, HD, 3D, and Curved TV. In this article, we will cover the innovative technologies and functionalities TCL TVs come with. Typical TCL TV models come with straightforward and unassuming industrial design. A big factor contributing to its ‘industrial’ feeling is the brushed metal outer body, solid frame, and jewel-like power button. In fact, TCL has won Reddot award in 2017 for its artwork in C2 series TVs. After years of persuasion by TV marketers to upgrade to 4K TV, finally, customers have started to accept 4K TVs as part of their household. The market for 4K TV is blooming thanks to growing 4K content availability. Even streaming services and game consoles have started supporting 4K. One of the major deterrents to buying a 4K used to be exorbitant pricing, especially by established players like Samsung and Sony. They priced their 4K TVs in a few lakhs a few years ago. But with the entry of Chinese players like Mi and TCL, even the Indian brands like Micromax and Intex for that matter, 4K TVs are much more affordable. TCL offers UHD 4K TVs in three variants, Smart TV, Android TV and Curved TV. TCL 4K TV delivers vivid details in all shades of light for an immersive viewing experience, via 3840×2160 pixels panel. Good picture clarity and appropriate image smoothness is the key forte of TCL TV, thanks to a resolution of 3840×2160 pixels. One prominent factor that has helped the push of 4K TVs is the advent of HDR. HDR stands for High Dynamic Range and it significantly expands the range of two important factors—contrast ratio and color accuracy. Thus, the bright parts of the image get much brighter, so it seems image possesses more depth. The color range expands to show brighter blues, greens, reds and everything in between. Thus HDR-compatible movies push TVs to their limit, with brighter highlights, perfect blacks, and wider color gamut. Combining this with the mesmerizingly powerful 4k resolution, movies look nothing less than stunning. Depending upon the model and pricing, TCL offers two types of HDR. HDR10 for 4k models like L55P2MUS and Dolby Vision for premium models like R615. It can be tricky for a novice buyer to discern between the two HDR formats. So, let’s understand what each HDR has to offer and how they differ. HDR10 is the most frequently used and easily available HDR format. Being an open source, this HDR version feature in TCL TV models coming with Android OS. TCL markets this HDR as HDR Pro but its more or less like standard HDR10 format. As it is open source format, it’s much easier to implement by TCL without needing to pay licensing fee. TCL has tweaked this HDR format to optimize their 4K TVs. It’s worth noting that most of the HDR Blu ray discs available in the market feature HDR10 format. TCL is one of the only few brands to offer curved TVs in India. The gently carved curves round the TCL’s TV helps the viewers to be at the epicenter of the action, providing them with an apparently wider view field and make their viewing experience more uniform. 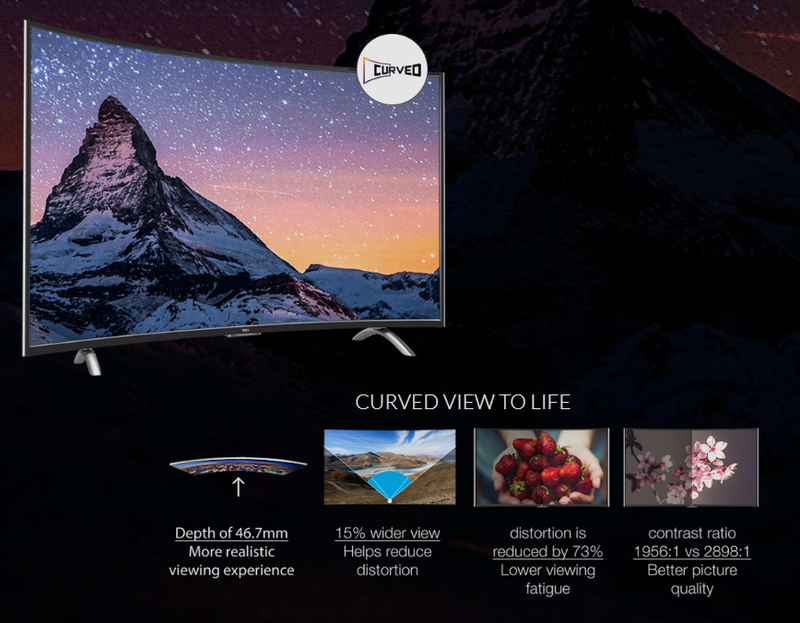 Curved TCL TVs deliver a wider field of vision, render greater depth, improve the contrast ratio and reduce distortion which enhances the overall TV viewing experience. Curved TVs are eccentric by design, giving users with more immersive experience of depth, sharpness, and contrast but the downside is they are slightly more vulnerable to the onscreen reflection of the incident light. Premium models from TCL come with an advanced iPQ picture engine that leads to precise color reproduction. TV coming with this technology are tailored to deliver accurate and optimized DCI-P3 color space coverage. The DCI-P3 colour space was introduced a few years back and it has a much wider gamut of colours than ordinary sRGB. So, TCL TVs show more colours than a TV with sRGB color space. Irrespective of the environment TCL 4K TVs are kept, from a dim home theater to a sun-lit bedroom, details remain visible with iPQ engine improving tone map’s accuracy to reproduce every detail within the brightest and darkest scenes. Premium 4K TCL TVs also feature WCG and NBP Photon technology for even more realistic colors. Wide Color Gamut (WCG) is an advanced technology which expands the colour spectrum in the TV to intensify shades and provide subtle tones in every picture frame. WCG technology results in a wider range of colours, giving life to the catchy scenes in the way that ordinary TVs can’t. To compliment WCG TCL TVs also come with Nano Band Phosphor (NBP) Photon technology that aids the WCG algorithm to do its job effectively without risking oversaturation. In practice, the results are fairly good and look above what a TV in the given price range is expected to deliver. TCL has bifurcated its TV OS in two—Android OS and Roku OS. Android OS is offered in most of the models shipped in India but a few premium models like R617 comes with Roku OS which is popular in the US. Models like C2US comes with Android Marshmallow and therefore has Google Play Store. Setting up the TCL Android 4K TV is a breeze especially if you have another Android smartphone set up with your Google account and Wi-Fi settings. 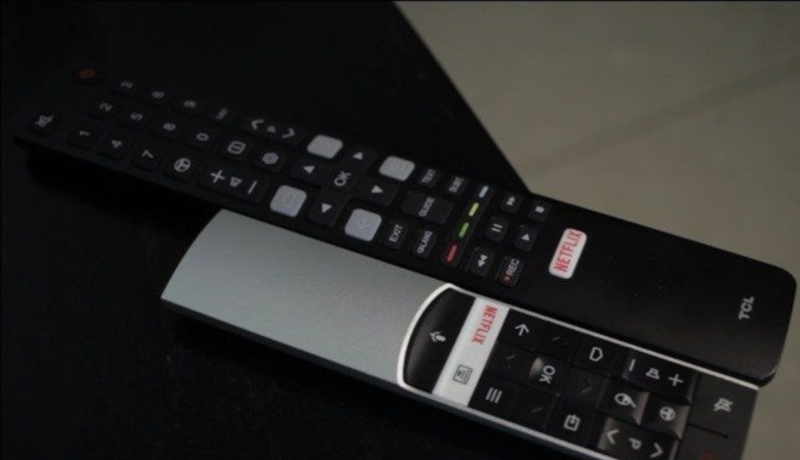 Netflix comes preinstalled and in fact, the remote comes with a dedicated Netflix button. Other usual Google apps that come preinstalled are YouTube, Google Play Movies, Google Play Music etc. Video content providing apps like Amazon Prime and Hotstar are suspiciously missing from the options available in the Google Play Store. One pleasant surprise TCL Android TV has a Chromecast built-in. This would allow users to seamless cast content from their smartphones to the TCL TV. This is nice if you have guest comes over to your place and they want to show their favorite video clip on the big screen. All the goodies aside Android TV also mean that there will be visibly long boot-up time. And no one really wants to deal with this especially in a TV. It takes good 30 seconds to load the system, and during that time no remote TV control options would work. Premium models coming with Roku OS on the other hand happily supports everything from Netflix to Amazon. Even there are some more additions in the form of tubi, Pluto.tv and Crackle (sounds alien names but they are fairly popular in markets like the US). TCL TVs with Roku OS supports Chromecast too like Android variants. Though Roku OS is easy and intuitive it would have been nicer had TCL included AI-powered personal assistants—similar to what Samsung is doing with Tizen and LG has done with WebOS. It is interesting to note that in just five years of partnership with Roku, TCL has made great strides in the Smart TV industry especially in the developed markets like the US, where it is the fastest growing TV brand despite being a Chinese company. Interestingly few TCL 4K Smart TVs come with two remotes. One of them is the conventional infrared type with a button for all the major TV control function and another is modern minimalistic one. If you don’t want to learn how to use new remote and stick with conventional remote, you can keep using the bigger remote. But the modern compact remote has additional functions like Bluetooth and voice control powered by Google. Voice control makes content discovery fair easier once you are accustomed to the remote. Two functions which we found missing with TCL TVs are sleep mode and brightness control. With no sleep mode in remote, temporarily turning off TV results in powering down completely. This implies that you’ll need to boot it up all over again and reopen the app you were using last. And not to forget the long boot up time Android TV takes. Similarly, there is no independent brightness control option on the remote to adjust brightness according to ambient lightning inside the room. High-end C2 series from TCL features Harman Kardon speakers with Dolby Digital Plus sound technology. For starters, Harman Kardon are premium class of speakers preferred mainly by automakers and related enterprises. The C2 series models coming with Harman Kardon speaker, have four separate unit and dual amplifier four drivers packed in. This helps in taking the entertainment quotient higher. The front design delivers direct sound wave and minimizes sound loss. Harman Kardon speakers are further complimented by Dolby Digital Plus technology which is an advanced surround sound technology providing consistent cinema-style audio across your content. Dolby Digital Plus adds depth and power for clear, crisp and realistic sound through elite Harman Kardon speakers. There is also ‘Stadium mode’ which creates stadium-like atmosphere aiding to the user’s sports viewing experience. Upon testing it was found that TCL TV with these features performs well in shows and movies where dialogue is the most important or prominent type of audio but falls a bit short on music or games where explosions reign supreme. Biggest plus point in favor of TCL TVs is a value-for-money proposition. TCL products are power packed with the latest technology and features at an affordable price. TCL TVs provide exposure to state-of-the-art TV technology to even budget-minded users. Color vibrancy is another plus point for TCL. Thanks to technologies like HDR Pro, WCG and NBP Photon pictures on TCL TV appear vivid and colorful with good contrast. What’s not good about 4K TCL TV is its upscaling. Internal scaler inside TCL TVs is mediocre and to view anything with less than 720p would no longer be enjoyable as there is an odd blurring effect. Another area where TCL TV needs improvement is motion handling. Though for the most part, it’s decent, but for watching a fast-paced action movie, the experience is not that delightful. Also, it has only 3-point setting for motion adjustment compared to 10-point setting offered by elite Samsung 4K models. Ports and other hardware is tightly cluttered at the back making insertion and ejection of cables difficult. Modern TCL 4K TVs combine 4K resolution with a high dynamic range to improve picture performance. The industrial metal design is aesthetically appealing and aptly compliments TV viewing experience. TVs with Dolby Vision support completely redefines TV entertainment experience by improving brightness and contrast. TCL’s contrast control cone technology discerns bright and dark spots in each frame of content. Thanks to Micro Dimming each zone is individually controlled within the frame to yield striking contrast between light and dark regions in the picture. Harman Kardon speakers with Dolby Digital Plus technology produces stunning sound that let’s oneself immerse into the world pleasant cinematic experience. With 250 PAN-India service centers, it has a good customer support network. If you cannot afford LG’s crazy-thin OLEDs or Samsung’s ultra-bright OLEDs but still want delightful 4K viewing experience with the immersive sound you can surely consider TCL 4K TVs, as they offer very good value even in the constrained budget.